We are winning the war against the insurgency at home just as our troops are winning the war against the insurgency in Iraq! All of our empirical evidence shows that local support for our counter protest actions is increasing while the opposition grows more disheartened week by week! The Rangers Up! website just came out with a new T-Shirt dedicated specifically to our operations which sums up the sentiment exactly. You can see it on the national website: http://www.gatheringofeagles.org. We need to increase the pressure we are putting on the opposition in every theater. Mark your calenders for the BIG ONE, Gathering of Eagles III, September 15th in Washington, DC, when we once more go toe to toe against the ANSWER Coalition, the Muslim American Society, CAIR, Code Pink, the Black Bloc, SDS and all the rest of George Soros’ puppets, who are trying to pressure Congress to retreat from Iraq. We need you to get the word out to everyone you can that we are on the move again to protect and defend our memorials and monuments against the radicals of the left. Before then, in less than two weeks we face off against the northeast moonbats in Kennebunkport once more. For many of us that is just a day trip away to the beautiful shore of Maine. The opposition will number in the hundreds perhaps thousands if their estimates are to be believed. We need to show up in force to capture the media attention and rain on their parade! If you or anyone you know can spare some cash to help us in this fight please visit the national website and click on the “Donate to GOE” item in the upper left corner. If you are uncomfortable using paypal you can make a check payable to GOE and mail it to GOE, PO Box 291; Chocowinity, NC 27817. Every little bit helps so donations of $5, $10, $20 or more are welcome! We also have a New York State website where you can get our local intelligence, local action alerts and news items about our activities in New York: http://newyork.gatheringofeagles.org. Please scroll down for our Action Alerts. If you have missed your chance to heap scorn and derision upon the media darling of the left wing, Cindy Sheehan, during her recent “Walk for Humanity” tour. If you want to show her your contempt for her consorting with the enemy during her August ‘Traitor’ tour of the Middle East. If you just want to go for a great ride through scenic New England with some fun action at the end then this is the Alert for You! Who: Cindy Sheehan, Dennis Kucinich, and a whole menagerie of traitors. This is a very big event in New England with lefties coming in from Boston and Portland. The opposition is predicting they will turn out 10,000 demonstrators. All the big names will be here. On July 1st we did a counter protest to a similar event there and held our own even though we were badly outnumbered. We didn’t get the word out in time or disperse it far enough for that one. We are doing a much better job with this one. This will be a good warm up for the Washington event in September. The ANSWER Coalition with their motley assortment of radical left wing organizations, Jihadist fronts, useful idiots and assorted whackos is sponsoring a huge march in DC on September 15th. Who: ANSWER Coalition of subversive organizations. This is the big one that all of us who went to DC in March have been expecting. The Black Bloc and SDS are buzzing about this one. They want a rematch with the veterans and patriots who put the kibosh on their March fun. If you can make no other event this year, this is the one to make. Eagles will be gathering from all across the nation to be in DC this day. If you cannot attend, or have extra bucks you can spare, now is the time to make a contribution of any amount to the cause at http://www.GatheringofEagles.org. If you could not make it in March, here is your chance to see what the combined might of patriots from across this nation looks like in action! Be LOUD, Be PROUD, Be THERE! Suggested items to bring: Water, Flags, signs, banners, cow bells, duck callers, megaphones and anything else you feel would make an impression on the moonbats. For up to the minute information on any events go to http://www.GatheringofEagles.org. For information on New York State events go to http://www.NewYork.GatheringofEagles.org. 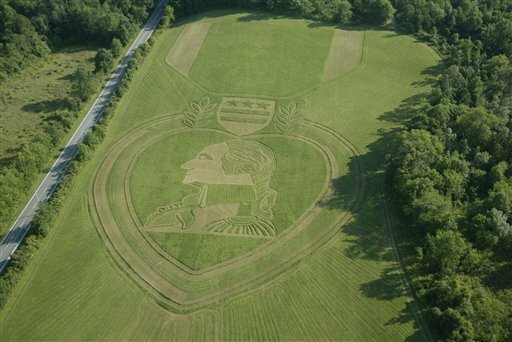 I am damn proud to inform you all that a New York Artist has created a Military Order of the Purple Heart Memorial in a New York State Park by mowing the image of the Medal into an 850,000 acre field. HAMPTONBURGH, N.Y. – An artist has mowed an 850,000-square-foot rendering of a Purple Heart medal into a park field to honor the 75th anniversary of the medal that commends servicemembers killed or wounded in action. The rendering, to be unveiled Sunday in Thomas Bull Memorial Park in this city 55 miles northwest of New York City, was done by field artist and painter Roger Baker, whose past works include the Statue of Liberty and Elvis Presley. According to Baker, the project followed a chance meeting with Bill Bacon, membership director of the Military Order of the Purple Heart. After meeting with officials from The National Purple Heart Hall of Honor and Orange County parks, the plan was on. The New Windsor Cantonment, in what is now Orange County, was the final encampment of the Revolutionary Army. To honor the service of select troops, Gen. George Washington presented a small purple cloth Badge of Merit – the precursor to the Purple Heart medal. In 1932, the Purple Heart was awarded to 150 veterans of World War I. The National Purple Heart Hall of Honor opened in New Windsor in 2006. Baker’s design was based on a photograph of the medal awarded to Art Livesey, a Middletown, N.Y., Marine Corps veteran who was wounded at Iwo Jima. The Memorial is located in Thomas Bull Memorial Park in Orange County just south of I-84 and midway between Middletown and Stewart International Airport. The field abuts Route 416 which runs north/south along the eastern perimeter of the park. The approximate size of the image is 500′ wide by 1,000′ long. Parking is available north of the field. My personal thanks to the artist for creating this memorial to honor all who sacrificed for our freedom today.